Heat almond milk in the microwave in a small bowl for 20 to 25 seconds or until warm to the touch, not too hot or it will kill the yeast. Stir in the sugar and sprinkle the yeast over the warm milk, allow to proof for 10 to 15 minutes. Prepare a 7×11 or 9×13 by brushing with oil or spraying with a non-stick cooking spray. In a large bowl whisk together the flour, salt and thyme. Add in the milk mixture and melted vegan butter. Mix until the dough comes together. Transfer to a floured work surface, sprinkle dough with a small amount of flour and knead dough for 5 minutes. Rub large bowl with vegan butter and place the dough in the bowl, cover and let rise 50 to 60 minutes. While dough is rising place all of the blueberry sauce ingredients in a small pot over medium-high heat and bring to a boil, once boiling reduce heat to medium low and simmer 10 to 15 minutes or until sauce has started to thicken. Transfer to a small bowl cover and allow to cool. Such will thicken as it cools. When the dough has doubled in size turn dough onto a lightly floured surface and shape into a 7×11 rectangle and with a lightly floured rolling pin. Spread half of the blueberry sauce over the dough and sprinkle the wild blueberries over the sauce. Starting with the long edge roll dough tightly. Slice and place in baking dish cover and allow to rise for 60 minutes. Bake for 20 minutes or until it starts to brown slightly. Remove from the oven and allow to cool a bit, about 5 minutes. While buns are cooling mix together the glaze ingredients until completely smooth. Pour glaze over the buns. 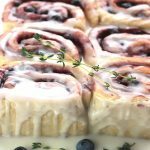 Serve buns with some of the blueberry sauce.